The vanity project. A source of so many bizarre and terrible films. The reigning king of this sub-genre is The Room (2005). 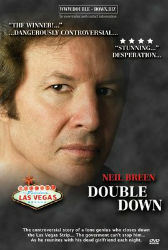 Lesser known, but just as astonishing, perhaps is writer/star/producer/director Neil Breen’s Double Down. Both films have quite a bit in common: They feature flawless main characters who are just too good for this wretched world. They have nonsensical plots which feel made up as they go along. Both directors shot their films in the most static way possible. Their main difference is in their leads. Tommy Wiseau possesses an impossible weird charisma, Neil Breen is the dullest man in dulltown. What The Room does not possess is an invisible force field that instantly kills unwary foes. Neil stars as Aaron Brand. Aaron is a computer scientist/decorated combat pilot/former intelligence agent turned terrorist-for-hire. Aaron hangs out in the desert. He uses his three Dell laptops, and stolen TV satellite dishes to control the computers and satellites of world governments. Someone assassinated his wife during his naked hot tub marriage proposal. This is a fact he won’t let anyone forget as he mentions it without end in his voice over. He might also have psychic powers or something because at this point, why not? He’s hired by an unnamed government to shut down Las Vegas by using a bio-weapon. I wouldn’t worry about that plot point though. The movie sure doesn’t seem to care. Double Down doesn’t have a story so much as it has a checklist of conspiracy nut elements to rattle off. There are secret government agents, clandestine technologies, and a whole host of bad guys in suits. Aaron is one of the most absurd characters in cinema history. He’s a cold blooded killer and a genius, but he’s happy to let you know he supports the troops and gives all his money to orphans. There are almost no other characters in the entire film. Anyone else dies within moments of their introduction. The only other figure that could even you could consider a character is his wife. I can’t ascribe any personality to her. She’s more of a McGuffin to keep Aaron doing his missions. The movie is prone to slather dull endless shots of the desert on top its insanity. If you’re addicted to watching a middle aged man climb up and down rocks, or take a nap in the back seat of his car, this the movie for you. It is a glacial paced mess filled with one non-event after another. There is only the promise of the next lunatic statement from Aaron’s voice over to keep you from turning the movie off. Double Down is not a good movie. It’s not an easy movie to get through. Yet, watching it is like staring into the abyss, and staring right back at you is, Neil Breen. At the core, I find it a more compelling look into its creator than anything the movie itself has to offer. Double Down presents us with an all-knowing, all-powerful central character. This is isn't enough though. There is something he can never have despite all his gifts. When the idealized character of Aaron bemoans, “I’m so depressed,” I know that’s Neil talking.